Funky Monkey Classic Slot Guide & Review - Casino Answers! Funky Monkey is a 3-reel, 1-line classic slot machine from Playtech. It is a multi-coin slot with the ability to play up to three coins per spin. You can play Funky Monkey at Casino Del Rio and Windows Casino. Funky Monkey is easy to understand and play for even the most novice of online casino players. 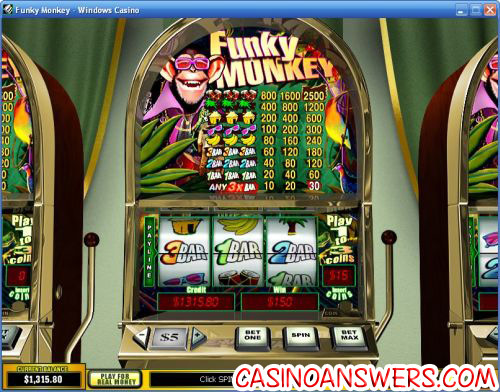 To play the Funk Monkey slot machine, select your coin value (from $0.05 up to $5). Then, you can choose to bet one, two or three coins. To bet 3 coins, simply hit the “Bet Max” button at the right and you will spin Funky Monkey’s reels automatically. To bet one or two coins, all you have to do is hit “Bet One” once or twice, then hit the “Spin” button. You will see the amount of your bet listed at the right of the game reels. Bets on Funky Monkey are $0.05, $0.10, $0.25, $0.50, $1, $2 and $5. The minumum bet per spin is a nickel and the maximum bet you can make on the Funky Monkey slot is $15 (a lot for a single payline slot machine). The best part about Funky Monkey is how generous the lower prizes are. Even 3 unmatched bars can win you 10X your bet on a one-coin spin. The top jackpot on Funky Monkey is 2500X when three bongo drum symbols appear in a row. If you win the top jackpot while playing at the maximum coin value, you will win $12,500. Winning combinations and payouts on the Funky Monkey classic slot are (1/2/3-coin payouts listed in parenthesis): any 3 bars (10/20/30), 3 1-bars (20/40/60), 3 2-bars (40/80/120), 3 3-bars (60/120/180), 3 bananas (80/60/240), 3 pairs of sunglasses (100/200/300), 3 huts (200/400/600), 3 trees (400/800/1200) and 3 bongo drums (800/1600/2500). To get a winning combination on Funky Monkey, you must line up three symbols exactly on the single center payline. This isn’t horseshoes; close doesn’t count. When you win, you will hear a quick sound effect and your winnings will be credited to your casino account. From its name, you expect the Funky Monkey slot machine to be a lot of fun. Really it’s just a slot machine. You would expect Playtech to have some better sound effects at the very least. There’s not even any monkey sounds. With that said, if all you are looking for is a classic nickel slot machine, Funky Monkey does deliver on that level. You can play Funky Monkey at all Playtech casinos, including Casino Del Rio. Do any US-friendly online casinos carry Funky Monkey? No, Playtech casinos are not US-friendly. US players can play similar slot machines at Club USA Casino. Does Funky Monkey have a progressive jackpot? Funky Monkey Fruit Machine Review?